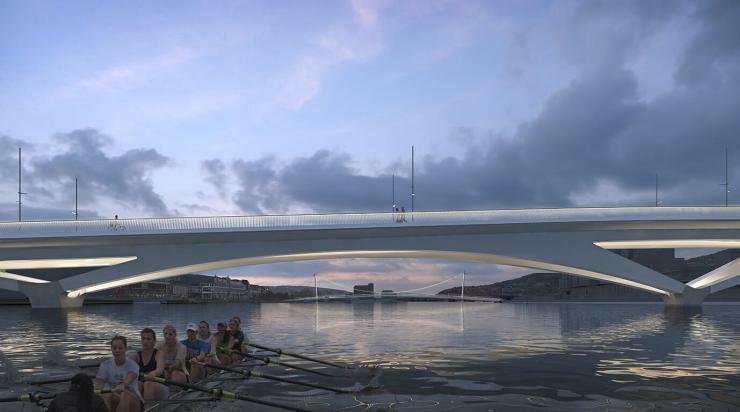 The city of Drammen in Norway has chosen the winner in an international contest to design a new pedestrian and highway bridge. The winning team is made up of UK infrastructure specialist Knight Architects, local architect SAAHA, engineer Degree of Freedom and landscape designer Asplan Viak. Knight Architects said that New City Bridge’s vertical alignment gives the bridge an asymmetrical appearance, accentuated by a series of arches, each taller and longer in span than the previous one. Looking from the south, the descending set of arches has been designed to introduce a sense of rhythm, reflecting the dynamic movement of a stone skimming across the water’s surface. An artificial peninsula in the shape of a stepped landscape acts as an urban ‘bookend’ for the bridge and accentuates the transition between bridge and shore line. Further along, the peninsula allows pedestrians to cross underneath the bridge, replacing the existing underpass. The bridge parapet will feature a sinuous line of vertical steel louvres, providing a high level of transparency. The parapet will be topped with a wide wooden handrail. A mix of durable hardwoods, high-quality concrete and matte stainless steel will be used to build the bridge, which is intended to become a destination in its own right as well as a crossing. 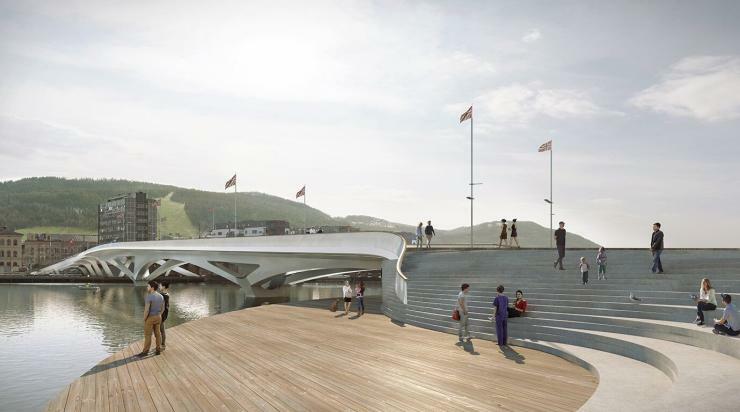 The city has also selected a footbridge design, also by Degree of Freedom, to complete a new network of cross-river connections.